Launch the 'Market' app on your Android device and search for "Waterman Buoy Monitor"
Go to the Android Market website and perform the same search. You'll need to log in with your GMail account to use this method. A waterman knows his buoy, the one that takes him through his day-to-day. He can tell you its 5 digit ID from memory, its the one he checks first thing, several times throughout a day, and one last time every night. With NOAA websites he can check current conditions in the places he cares about, he can see recent data so he spots the trends, and the forecasts help him plan ahead. Of course those are websites, not really mobile friendly, and it takes more than a few clicks to see it all. That's where The Waterman Buoy Monitor comes in! It provides you with all of that information, aggregated into an at-a-glance, intuitive display that is relevant to the way a waterman plans for a surf or a dive, to fish or to get under way. By showing him the sea state and wind now, their forecast and the state of the local tides. 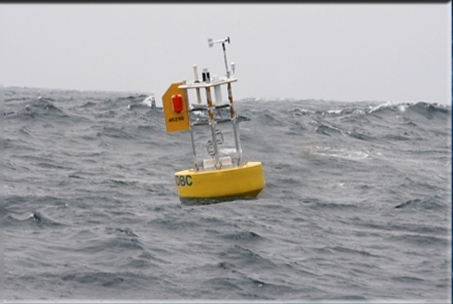 The Waterman Buoy Monitor draws this information from the network of floating buoys maintained by the National Oceanographic and Atmostpheric Administration (NOAA) and its National Weather Service (NWS) and National Data Buoy Center (NDBC).